The Bribery Commission (BC) is to appoint legal experts to study the Presidential Commission of Inquiry (PCoI) report on the Central Bank bond sales to determine action over the findings of the report pertaining to the Bribery Act, a commission official said. 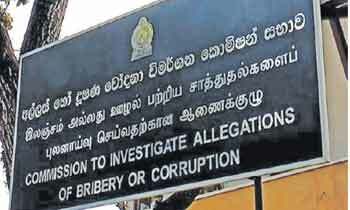 On a directive of President Maithripala Sirisena, the Commission to Investigate Allegations of Bribery or Corruption (CIABOC) received a copy of the PCoI Report for further legal action. A senior BC official confirmed the receipt of the copy of the report and said it had to be subjected to a in depth study before resorting to any legal action. He said BC officials were discussing the matter with senior management on the appointment of legal experts attached to BC. Based on their report the BC will determine how best to proceed with legal action on the PCoI report. The BC which consists of lawyers needs legal experts to study the PCoI report. This is correct. I am amused to see how the standard 8 and GCE OL ladies and gentlemen at Kotte will study this.